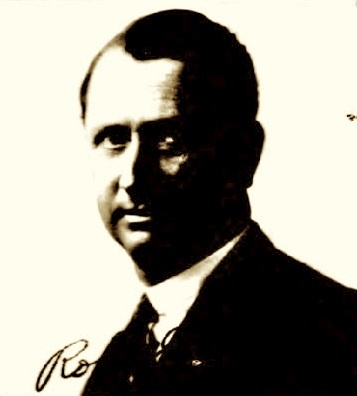 Robert Gould Goree was born on 27 October 1879 in Thorp Spring, Hood County, Texas. He married Sara B. Thomasson, daughter of Abb Thomasson and Laura A. McMannis, circa 1907. Robert Gould Goree and Sara B. Thomasson appeared in the US federal census of 15 April 1910 in Imperial, Imperial County, California. Other members of the household included Robert Gould Goree Jr. He was a hardware salesman, according to the 1910 census. Robert Gould Goree registered for the draft on 12 September 1918 in Imperial County, California, while living with his wife Sara in Calexico, self-employed there as a cotton grower. The following appeared on 10 December 1918 in the Calexico Chronicle: Today, what was to have been a merry family party at the home of Robert G. Goree, has been turned into a house of mourning by a message which told of the death in France of Lieut. Rogers C. Goree, American aviator and nephew of R. G. Goree. There were no details -- memely the cold and awful facts flashed by the wife of the dead aviator, who less than three months ago became his bride in New Orleans and at once said good bye as he was then ordered to the front. Saturday night R. G. Goree was in Los Angeles and took dinner with Leiut. John Goree, also an aviator, and an instructor in the aviation school, and today the mother of the Goree boys, with another son, Paul, who is home on a furlough from the navy, came here, along with Mr. Goree's father to spend the day and to hear from and about Lieut. John. Standing on the street and ready to go home to meet his relatives and guests, a messenger boy handed Mr. Goree a message telling of the death of Rogers by an airplane accident. Filled with emotion he said, "And the is the message I must take home to the mother!? The marriage of Lieut. Rogers Goree and Roselle Gould of Austin, Texas, was a pretty romance. The grandfather of the bride, Colonel Gould, commanded a regiment in the Confederate army in which the grandfather of the groom commanded a company. The two veterans were not only comrades but friends, and when their grandchildren were married it was a source of great satisfaction. Then at the alter, almost, came the summons to war, and the young husband, with the fighting blood of his southern ancestors in his veins, cheerfully said good bye and his bride, with the same red blood in her veins, said "Godspeed" and gave him to his country. Then came the anxious days and then the news of peace and the thoughts of home for the soldier and of his return by his bride, and then -- the fateful message that ended the dreams of the future and left life cold and gray. And so there will be a commingling this Christmas time of the cypress and the holly in the Goree homes and tears of the wife and the tears of the mother will bear once again silent but eloquent testimony that "men must fight and women weep." Rogers Goree, as he was known here to many, had a host of friends who will be deeply grieved to hear of his death. S. T. Tyler, of the Irrigation district, called at the Chronicle office this morning and said, "He was one of the best men we ever had." This brief but feeling tribute tells what was thought of the dead man here. Faithful in his private life, he was a good soldier and faithful to his country. No greater honor may be given to any man. Robert Gould Goree and Sara B. Thomasson appeared in the US federal census of 1 January 1920 in San Diego, San Digeo County, California, at 3775 Oregon Street. Other members of the household included Robert Gould Goree Jr., Frances Anne Goree and Edwin T. Goree. He was operating a cotton gin, according to the 1920 census. On 25 April 1925 Robert G. Goree was issued a passport for travel to Salvador, Central and South America for the purpose of investigating cotton and cotton gins, to sail aboard the "Ecuador" on 15 May. Robert Gould Goree and Sara B. Thomasson appeared in the US federal census of 1 April 1930 in San Diego, San Diego County, California, at 3575 Pershing Avenue. Other members of the household included Frances Anne Goree and Edwin T. Goree. Robert Gould Goree and Sara B. Thomasson appeared in the US federal census of 1 April 1940 in San Diego, California, at 3575 Pershing Avenue. Other members of the household included Edwin T. Goree. In 1935 niece Alice was living in rural Santa Cruz County. Robert Gould Goree became a widower at the 4 October 1948 death of his wife Sara B. Thomasson. He married Fannie Kate Wood, daughter of Solomon William Wood Jr. and Elizabeth B. Hurst, say 1950. He was in the cotton gin business, according to his death certificate. Robert Gould Goree died on 3 March 1961 at age 81 in Navasota, Grimes County, Texas, at 709 Holland Street . His death was officially witnessed by Fannie Kate Wood.